The bottle of 2013 Proprietor’s Block Syrah from Kacaba Vineyards & Winery was a bit of a mystery to me. 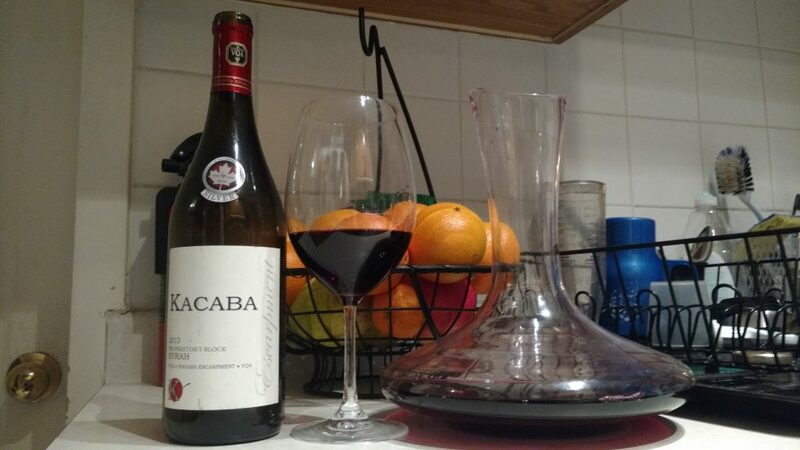 I remember going to Kacaba with our out of town wedding guests the day before our wedding, and I even vaguely remember really liking the syrah and buying a bottle. And that’s about it. I wasn’t sure if this is one of those wines you actually like, or if you have fond memories surrounding it. It retails for $30.15 at the vineyard, although it appears to have sold out in the few days between when I drank the wine and when I wrote the article. The price tag explains why I hoarded this one for a while. I was waiting for just the right steak to get into this bad boy. The grapes are from the south facing slopes of Proprietor’s Block vineyard in Vineland, ON, a part of the Niagara Escarpment that gets a lot of sunshine during a sunny year. This vintage was a Silver Medal winner in the Wine Align National Wine Awards of Canada, and clocks in at a respectable 13% ABV. I prefer the syrah style over shiraz’s jammy flavours, and I prefer decanting this varietal as the tannins can be a little harsh at times. Pardon the mess on my counter, our dining room has lousy lighting and my kitchen is perpetually messy. Appearance: Deep ruby with violet undertones. Developing rim. Aroma: Dark cherry skin, cassis, leather, violets, savoury meat. Taste: Palate is very close to the bouquet. Deep fruit notes, smokey and savoury meats, vanilla. Well-balanced tannins prior to decanting, and decanting helped. Dark chocolate. Cola. Green peppers. Aftertaste: Lingering deep cherry with heavy savoury notes. Suggested food pairing: Steak as rare as you’re comfortable eating, game meats. Could also pair with a salted dark chocolate. Overall: Very lovely, fringing on full bodied wine. Definitely pair with food. Would stand up nicely to a Rhône Valley Syrah at a fraction of the cost for a comparable flavour. A lovely example of the Niagara Escarpment’s terroir on a sunny summer.